There is a Barton In Fabis in every man's life. There is always a road that leads to it, and you had better hope there is another that leads out. I ran in to it with my friend Sean, on a long Sunday run, and did not know what would happen next. The energy reserves were empty (Fabis is Latin for beans, and I was not full of them), and my left leg was going numb. Yes numb. 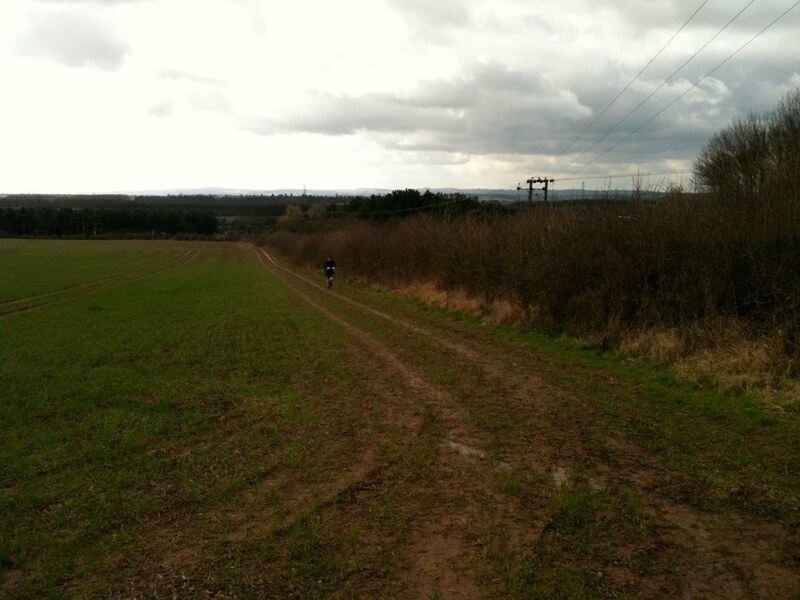 If you've never lost feeling in a leg while running, it is a very worrying thing. Especially when you've seen an MRI of the inside of your back (remember The Vapors' 'Turning Japanese': I asked the doctor to take your picture, / So I can look at you from inside as well ...? ), and it looks like a gravel pond from the post-Industrial wastes of North Wales. There is nothing good about this picture. So how did I find myself on this road? Ten months ago I tore my hamstring while running the Edinburgh Marathon. The road to recovery has been long and inconclusive. I lost all fitness and speed while resting, and while I can still run it is painful, and the pain does not seem to be diminishing, while I am not getting any faster. I've been puzzled about this, very puzzled. 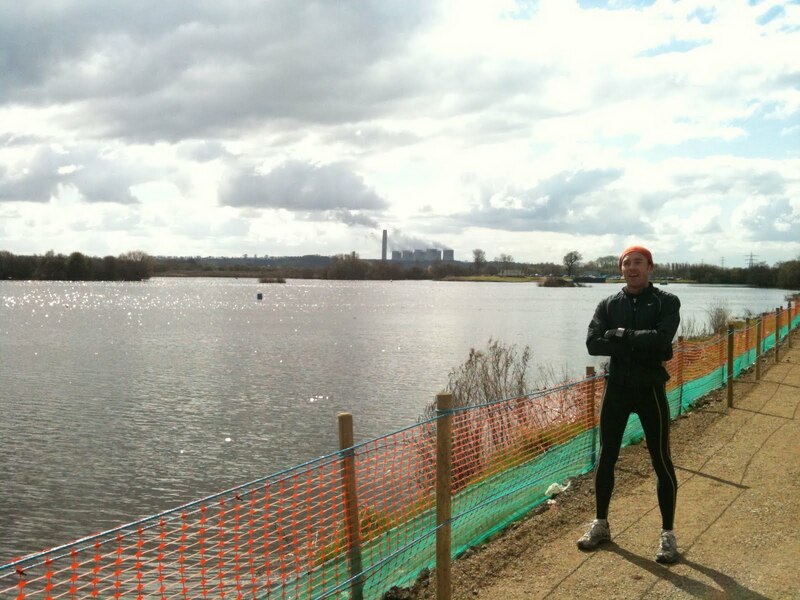 It's taken much of the joy out of running, and most of the life out of this blog. And all the time I've been anticipating the London Marathon, now days away. Would I be able to run? This is my training schedule, in its entirety, excluding all short, slow and probably physiologically pointless runs. 13 March: Race ... Roman Road Run. Missed start. 17 March: Race: 800 m university sports. 2.40. Very slow but it did not affect outcome as I started an hour before everyone else owing to a meeting. 17 March: Race: 100 m, 13 s. See above. 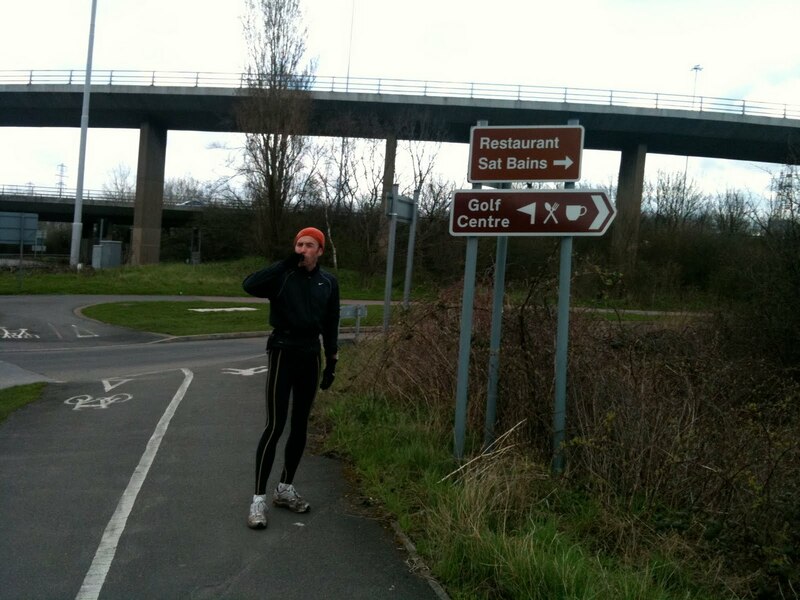 21 March: Long run. Felt unwell, so did it on 22nd instead. Bailed at 13 because the weather was too bad and I was underdressed. Etc. 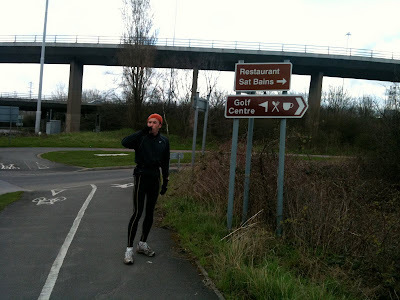 4 April: First long run -- in the sense of long run as I would have understood it when I was a proper runner -- with Sean in Long Eaton, 20 miles. That's it, my training schedule. London beckons on 25 April, and I have a place at the Exclusive Start for Very Fast People. Everyone else at that start will be fine tuned, pure aerodynamic muscle, and have a shaved head (every man that is -- only some of the women). So we run through waters up to our ankles, and feel the exclusive joy of completely sodden socks and shoes. A bridge takes us over the canal and through the shipyards and soon we pass the power station and run on into Radcliffe on Trent and then up some very old hills. I am still feeling human at this point. I have been in pain for many miles, however, unsure whether I should tell Sean. The hillside fields are newly plowed, and our wet shoes are now heavy with the farming soil. Then we followed the south bank of the Trent through parklands and woods, all beautiful, and all telling me that I had to stop, that I was empty, in pain, and without sensation in my left leg. I had to hobble over all gates and other obstacles, always leading with my right. London never seemed so far away. Having crossed the Trent we descended to river level once again, and found ourselves just behind Sat Bains' restaurant. I've never been there, but I'm told it is one of the finest in the country. I was very hungry. I thought about knocking on the back door and begging for a slow cooked egg, or at least some dahl. Or some porridge. Or even a sandwich. But he would probably not be there, and anyway it would take too long to explain about my leg, and the car accident and everything. So instead I consumed the one gel I had brought with me. We passed the windowless Imperial Tobacco bunker on our right, and then a Boots building, like an aircraft hangar, and I thought about D.H. Lawrence's poem about the University of Nottingham ('In Nottingham, that dismal town ...'), then an under-12s rugby festival on our left, and then followed the Nottingham to Beeston Canal to the Trent. I was beyond hope at this point. The sensation had come back in my leg, only to disappear again. And now there were people around, while I feared being dropped, like a domestique on the last climb of the day ... Sean offered some hope by talking through T.S. Eliot's very complicated and capricious relationship to Lawrence. It was a plaster for my suffering, but by now I was counting the miles. We arrived at a marina and there were only another four to go. Through the Attenborough Nature Reserve -- the sun had replaced the earlier rain and occasional shower -- and still the towers loomed, though not perhaps now so large, or at least further away. 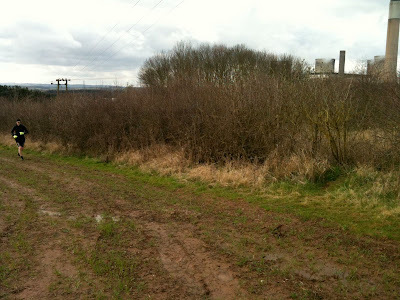 On the far side of the nature reserve was Long Eaton. We stepped lightly over protruding roots, skipped along past dogs and their walkers and children watching toy sailboats in the river. 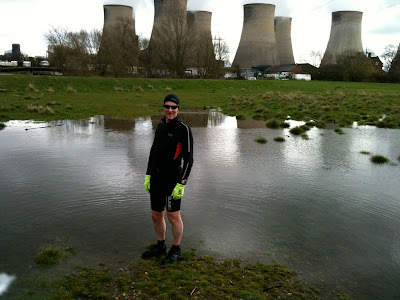 Then Long Eaton, then Tamworth Road, and then the finish line. No one cheered, no one wept, no one said a word. Twenty miles and three and a half hours. And so now I think: do I run London? What do you think? I could plod around it in 4 hours, perhaps, slower for sure than that day -- it seems more than a lifetime ago -- when I paced minor-celebrity Ned around, still living on old fitness. Or I could save myself for the autumn, and hope that I can run properly then. Numbness in the leg means that the problem is probably less muscular than neural, which would demand a different road to recovery. Why do we do this? I could say that we do it to stay honest (see under Ken Clarke, above). That we do it to put Barton In Fabis behind us. That we do it to understand friendships. That we do it in order not to be humiliated at the London Marathon. But in truth none of these would be sufficient: we do it because we're runners, and why we're runners no one knows. well, if you're going to do it, please don't shave your head. You'll still finish before me. My training looks a bit like yours, only slower. I'm thinking of Berlin in September as a salve for London.